Measuring the real costs and benefits of breaching four dams on the lower Snake River. In the lower Snake River, between the Snake's confluence with the Columbia River at Pasco, Washington, and Lewiston, Idaho, sit four dams. The U.S. Army Corps of Engineers constructed them between 1962 and 1975, primarily to create a series of ponds so barges could reach Lewiston, and secondarily to provide easy access to water for irrigation and to generate hydropower. As wild salmon stocks returning to the Snake River have plummeted, a chorus of fisheries biologists and others has called for breaching or bypassing the dams – removing the earthen mounds adjacent to the concrete portions of the dams and letting the river run free. Proponents argue that breaching the dams would, among other things, restore endangered wild salmon, return traditional sites and fisheries to Indian tribes, improve water quality, reduce taxpayer subsidies to corporate irrigators and barging companies, and comply with numerous laws and treaties. Others claim such action would prove prohibitively costly, even wreck the Northwest's economy. This important issue for the Northwest has politicians, interest groups, and citizens choosing sides. Unfortunately, though not unexpectedly, some of our leaders are making statements that muddy the waters – or worse, mislead the public. In a July 27, 1999, speech, Senator Slade Gorton (R-Washington) claimed that "removing the four Snake River dams in southeast Washington would be an unmitigated disaster and an economic nightmare." In February of this year, Texas Governor George W. Bush followed with, "Breaching the [Snake River] dams would be a big mistake. . . . 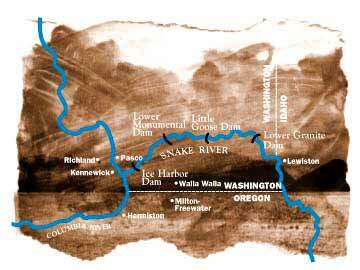 The economy and jobs of much of the Northwest depend on the dams." In its May 1, 2000, editorial, The Oregonian likened breaching the dams to "taking a sledgehammer to the Northwest economy." Unable to resist jumping on this befuddled bandwagon, the Clinton Administration and Vice President Al Gore recently decided to leave the dams in place while we try other salmon recovery programs. If only their memories were a bit longer. Just ten years ago, many politicians offered similar predictions on the disastrous effects of protecting the northern spotted owl. "We'll be up to our neck in owls, and every millworker will be out of a job," predicted President George Bush during a campaign swing through the Pacific Northwest in 1992. "It is time we worried not only about endangered species, but endangered jobs." Bush, and many of the other politicians in those years – Senators Mark Hatfield and Bob Packwood and Congressman Bob Smith – embraced the simplistic logic of owls versus jobs, just as some today frame the dam-breaching debate as salmon versus jobs: We can protect endangered jobs, or we can protect endangered species, but not both. They and their logic were wrong. The sky didn't fall. Indeed, the Pacific Northwest economy has boomed, consistently outperforming the national economy, whether measured by jobs, income, or sheer exuberance, throughout the 1990s. Between 1988 and 1997 logging in Oregon and Washington fell 87 percent on federal lands and 47 percent overall, and timber-industry employment dropped 21 percent. But new jobs in other sectors offset these losses. Total employment actually increased 32 percent, while real per capita income grew 21 percent. Ten years ago, those who predicted disaster at least had an excuse: This region had never experienced widespread economic changes to protect a species. Today, that excuse is gone, but, still, many haven't learned the lessons. In that same July 1999 speech warning of an economic "nightmare," Senator Gorton predicted the effects of breaching the dams. "What do we get by removing the four Snake River dams?" he asked. "Shattered lives, displaced families and communities . . . generations of family farmers penniless," he answered. In a June 4, 2000, column in The Oregonian, former Senator Hatfield wrote that breaching the dams would cost $300 million per year. These two predictions, though wrong, illustrate two of the main types of effects economists try to estimate when advising others on any major public investment or program. Gorton is talking about, among other things, changes in jobs and incomes in the Pacific Northwest. Hatfield is talking about changes in the dollar-denominated costs and benefits for the nation as a whole. 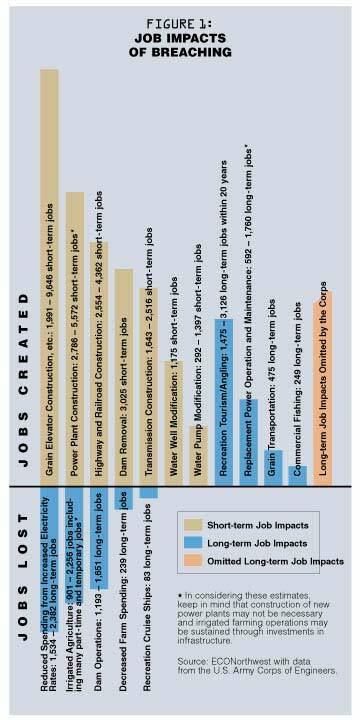 Figure 1 summarizes the Corps' estimates of the impact breaching the dams would have on jobs. According to the Corps, breaching the dams would create 13,400 to 27,700 short-term jobs during the decade of deconstruction and construction. In the long-term, there would be job losses and gains. The biggest gains, between 1,475 and 3,126 jobs, would result from improved recreational tourism and angling opportunities. The largest losses of long-term jobs would occur in irrigated agriculture (901—2,256), the operations of the existing dams and locks (1,193—1,651), and reduced spending caused by increased electricity rates (1,534 —2,382). Taking the midpoints of the ranges shown in Figure 1, breaching the dams would cause a net loss of 1,081 long-term jobs in the Pacific Northwest (4,200 jobs gained, 5,281 jobs lost). Let's put these figures in perspective. By the end of this year, Washington, Oregon, and Idaho will have 4.8 million workers. For the three states, then, the net loss of 1,081 jobs would amount to about one-fiftieth of 1 percent of all jobs. For the twenty-five counties in southeastern Washington, northeastern Oregon, and central Idaho near the lower Snake River – the counties the Corps treats as the relevant local economy – the Corps estimated a net loss of 711 long-term jobs, less than one-fifth of 1 percent of the employment in these counties. For another perspective, compare the total number of jobs the Corps predicts would be lost – 5,281 gross, not net – with the 20,000 jobs lost in the timber industry during the past decade. The implication is clear. The job losses predicted by the Corps do not rise anywhere near the level of "disaster," "nightmare," or "sledgehammer" for either the local or the regional economy. But wait. It gets worse. The Corps has overestimated the long-term losses and underestimated the long-term gains, making these predictions from the politicians and editorial writers, these Chicken Little cries of alarm, look even more preposterous. The tool the Corps employed to estimate the impact of breaching on jobs and incomes "presents," as the Corps itself states, "a picture of the economy at a single point in time" and that point is 1995. Furthermore, the Corps assumes "the long-run effects are permanent and continue for the 100-year period analyzed in this study." everyone throughout this chain who lost her or his job would act exactly the same way as the original job losers in that they would never work again. That makes the number 2,256 – or any other estimate derived from the Corps' nonsensical assumptions – an impossible result and worthless. And, of course, it's certainly not a forecast. As University of Montana economist Tom Power puts it, this is like driving by looking in the rearview mirror. The Corps number comes from a shapshot that petrifies conditions in 1995. As insight into the future, it is a fantasy that ignores all the dynamic adjustments economies – employees and employers, buyers and sellers, savers and investors, and all other economic decision-makers – undertake all the time. But "time," of course, is the point the Corps missed. Had the Corps taken a video of the past few decades, instead of a snapshot of 1995, it might have avoided this error. It might have noticed, for example, that since the four dams began service, the agricultural sector experienced four major contractions, each of which affected more workers than 2,256, the maximum the Corps predicts breaching the dams would affect. And yet, the local and regional economies have expanded steadily during this period. The point: A snapshot of lost jobs at a point in time tells you very little about how a real economy will react to the breaching of four dams or any other changes. How about the 1,534 to 2,382 jobs the Corps predicts would be lost as regional households and firms reduce spending in response to projected increases in electricity rates? The Corps predicts that the cost of replacing the hydropower now produced by the dams – $271 million per year – would equal the cost of using gas-fired combustion turbines for electricity instead. 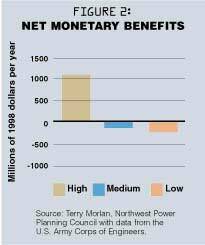 Then, the Corps illustrates, not forecasts, the impact that an additional cost of $271 million per year would have on Pacific Northwest electric rates, assuming the region's ratepayers had to cover it all – that is, pay for the new generation facilities out of their pockets. Don Reading, an economic consultant and former staff director and economist at the Idaho Public Utilities Commission, offered two reasons for regarding the Corps' estimates of job losses as too high. First, combustion turbines represent the upper boundary of the potential cost. Actual costs would be lower as the recently deregulated wholesale market would work to substitute cheaper energy sources for the gas turbines – the current price hike notwithstanding. Second, even the Corps isn't predicting Pacific Northwest ratepayers would bear all the costs of new power facilities. These are federal dams, federal laws, and, in effect, a federal river and federal fish. It seems reasonable to expect the federal government – U.S. taxpayers – to bear at least some, perhaps most, of the costs. Then, the Corps, using a Brownie instead of a Sony, compounds the overestimate of job losses from the increased electricity rates. The Corps implicitly assumes that, for the next century, the region's ratepayers would take no action to use their now more expensive electricity more efficiently, and the local and regional firms that otherwise would have sold goods and services to the now poorer ratepayers would lose those sales and would find no replacement sales, leaving workers permanently out of work and firms permanently out of business. The Corps committed its snapshot error, in part, because it confused jobs with the workers holding the jobs. A job may disappear for 100 years, but the person holding that job doesn't remain unemployed for 100 years. That's a big difference. Consider these findings from a recent study by the U.S. Department of Labor. Of all U.S. workers who lost jobs in 1995—96, half found a replacement job in less than eight weeks and 83 percent found work by February 1998. More than half of the workers displaced from full-time jobs who subsequently obtained full-time employment were earning at least as much as they did before displacement. Workers in rural areas have fared as well as, or better than, their urban counterparts. Let's also look at the Corps' largest category of gains in long-term jobs – recreation. In other reports, I question what the Corps tried to measure with its estimate of 1,475 to 3,126 long-term jobs gained. Here let's focus only on what the Corps didn't measure. Urban and regional economists in the Pacific Northwest widely agree about the importance to economic growth of the region's reputation for a high quality of life. A 1999 Oregon Employment Department survey found that 44 percent of the state's new arrivals list the state's quality of life as the primary reason for moving here. This is the salient economic impact of recreation. The jobs the Corps looks at are only an indirect indicator, a shadow on the cave wall. The dollars outside anglers, hikers, and kayakers bring into the local or regional economy or the workers such activities employ don't capture the biggest economic impact of restored salmon runs and a 140-mile stretch of free-flowing river in a spectacular canyon. That impact is better captured by the number of talented Northwesterners salmon and undammed rivers dissuade from emigrating and the number of talented non-Northwesterners they persuade to immigrate – and their jobs, spending, and investments – whether they ever catch a fish, take a hike, or paddle a kayak. And the Corps doesn't even mention them. Now let's look at some other numbers that have been offered to measure the effects of bypassing the dams. That $300 million estimate of costs Hatfield and many others have cited comes from the Corps' study, but it doesn't measure what Hatfield and the others think it measures. To put these numbers we're tossing around in perspective, consider that personal income – a measure of our ability to pay for things – in Oregon, Washington, and Idaho will exceed $300 billion this year. Even if the Corps' figure of $300 million doesn't overestimate the net costs of breaching the dams, which it does, and even if the Pacific Northwest had to pick up the full tab for breaching the dams, which it wouldn't, then the cost would amount to one-tenth of 1 percent of our total personal income. It's simply silly to predict that such a relatively minor economic effect would cause a "disaster," or a "nightmare," or would take "a sledge-hammer to the Northwest economy." Moreover, $300 million almost certainly overestimates what the actual cost would be. Figure 2, adapted from a presentation made by Terry Morlan, manager of economic analysis at the Northwest Power Planning Council in Portland, summarizes the Corps' estimates of the net monetary benefits (benefits minus costs) from breaching the dams. The high estimate of net costs is $300 million. That's the figure Hatfield and the others have used. But the high estimate of net benefits is $1.3 billion, a figure Hatfield and others failed to mention. This huge range – $300 million in net costs to $1.3 billion in net benefits – stems largely from the wide range in estimates of the benefits from river recreation that would result from breaching the dams, a range of $75 million to $1.5 billion. But none of these figures reflects a comprehensive examination of the true costs and benefits of breaching these four dams. The Corps probably overestimated the costs of breaching and definitely underestimated the benefits. The Corps identified five types of costs that breaching the dams would impose: reservoir-based recreation; water use; transportation; implementation; and electricity. And it identified four types of benefits: river-based recreation; commercial fishing; recreational angling; and the dams-and-locks-re lated costs that breaching would allow us to avoid. I've already discussed how the Corps reports a worst-case cost for the single biggest category of monetary costs: $271 million per year to replace the electric power generated by the dams. But the Corps committed its biggest errors on the benefit side of its cost-benefit analysis. In estimating the benefits from breaching the dams, the Corps excluded two large categories, namely, the vast bulk of tribe-related benefits and the benefits all of us gain from the mere existence of both the increased salmon runs and a free-flowing lower Snake. The first category concerns the tribes. The Corps excludes the benefits tribal members and other Northwesterners and Americans would get from the tribes regaining access to sacred and traditional sites as well as to ceremonial fisheries. In doing so, it overlooks many economic benefits to tribal members – such as potential reductions in mortality, decreases in morbidity, and enhancements to spiritual well-being – that constitute real increases in the value of national goods and services. This is an egregious error. As a result, the Corps has underestimated how breaching the dams benefits the tribes, and how that, in turn, benefits all of us. The second large category of benefits the Corps excluded from its cost-benefit tally concerns what the Corps calls passive-use benefits Northwesterners and other Americans would enjoy from both the increased salmon runs and from converting the lower Snake to 140 miles of free-flowing river. These values come not from using the resources – the salmon or the river – but from knowing the salmon and the free-flowing river exist and that future generations will get to enjoy them. These values aren't trivial. Economists working for the Corps estimated that the passive-use values of these two resources range from $486 million to nearly $1.3 billion. If these were incorporated into Figure 2, for example, the range would change to a low of $186 million net benefits to a high of $2.6 billion net benefits. For another perspective on these values, consider a study led by Western Washington University economist Dan Hagen and published in 1992. He and his fellow researchers conducted a national survey from which they found that the benefits of preserving the spotted owl here in the Pacific Northwest outweighed the costs by at least three to one. In 1992, few Americans had heard of the northern spotted owl. In 2000, almost every American has heard of salmon and can visualize images of salmon cresting rapids. For many, perhaps most, Americans, the salmon is a symbol of the Pacific Northwest. If we scan the economic data since the Corps built the dams, we find no surge in jobs and incomes in the sectors that depend on the dams, locks, and barges. In fact, we find contractions in the jobs related to irrigated agriculture. And we find fewer acres of wheat harvested in the counties that ship grain by barge. The growth that has occurred can be found in other sectors, sectors unrelated to the dams. And the roughly 3.5 percent of the Northwest's electricity that the dams generate doesn't explain the growth. By ignoring the dynamic trends and forces behind the numbers it plucked from 1995, the Corps seems determined to commit the same error others committed in the early '90s when they saw the spotted owl as a feathered apocalypse. The Corps has squinted at the punctuation, thereby missing the story unfold-ing around them. Unlike most other Americans, Northwesterners have not only read this story, they've lived it very recently. And they now know it can have a happy ending. Not everyone, of course, will be happy if the dams are breached. We can and should provide targeted and effective assistance to farm workers, barge workers, and dam operators to find new jobs as well as to businesses to recoup investments based on their expectations that the dams would remain forever. Breaching the dams would not be a small step. But it would yield both economic benefits and economic costs, a fact that seems so obvious and yet gets ignored. And if I'm right about the overlooked benefits of breaching, then not breaching will have negative, long-run impacts on the economy. The story told by the 1990s in the Pacific Northwest offers valuable lessons. We have only to learn and apply them. Ed Whitelaw is a professor of economics at the UO, president of ECONorthwest, and a frequent contributor to Oregon Quarterly. His ECONorthwest colleagues Anne Fifield, Ed MacMullan, and Ernie Niemi provided excellent technical and editorial advice for this article. More information about this issue is available at www.SalmonAndEconomy.org.